Let fans face the music - live! In the UK, we strongly associate summer with music festivals. Whether on the grounds of a muddy farmer's field or under the gaze of an historic castle, we flock to hear our favourite bands play, and we get caught up in the unique spirit of these gatherings. More than 225 festivals are being held this year, from family-run events to the king of festivals - Glastonbury. They keep growing in size and scope, helped in large part by the opportunities presented by social media and the ability to broadcast events and promotional activities out live. No matter how big or small a festival, the chance to make yours memorable to as many people as possible is easy if you live stream to audiences everywhere. Energise attendees by live streaming your festival setup and band interviews, and live stream to fans who can't attend. If you're looking for ways to generate more revenue, you can even sell advertising space on live streams. Last summer, global online music broadcasting platform, Boiler Room, provided an unprecedented 42 hours of live coverage of the Notting Hill Carnival. Almost 1.5 million people celebrated the Notting Hill Carnival - one of the world's largest street festivals. Yet, although this annual event celebrating black British culture and music attracts more than six times more participants than the Glastonbury Festival, it receives far less media coverage. By continuously live streaming performances, Boiler Room set out to give the event the global recognition it deserves. People love all live-streamed sports - every type from tennis to car racing, and every level from Premier League to community matches. If you doubt that statement, consider this: while Man City was challenging Barcelona in the group stages of the Champions League, 2.2 million people were glued to the Facebook Live stream of England's qualifying match in ¦ wait for it ¦ table tennis! Pre-season matches offer fans around the world the chance to see their favourite teams in action. Thousands faithfully attend matches in anticipation of seeing the first glimpse of their team for the season ahead. But live streaming these pre-season games also offers a chance to build the fan base of those who can't attend the tour dates, which are often overseas. At Garland, we've helped live stream everything from local community sports to Premier League football matches. Nothing will help you achieve your live streaming goals better than the latest easy-to-use, cost-effective solutions offered by LiveU. There's no denying that LiveU has earned its reputation as the go-to solution for those looking to stream live over bonded-cellular, wireless and fixed-IP networks. 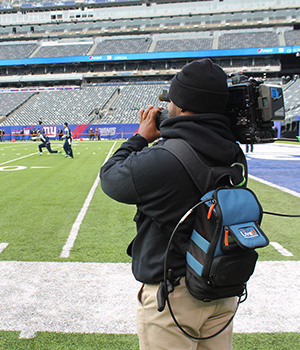 For years, major broadcasters around the world have been using LiveU's innovative, high-quality products to live stream news coverage, concerts and major sporting events. LiveU's two latest products - LiveU Solo and LU600 - have captured the imaginations of organisations everywhere, significantly expanding the types of events that can now be live streamed. Let's start with the LiveU Solo. This easy-to-use unit offers one-touch, wireless live streaming, directly from your camera to the web, including Facebook Live, and delivers professional quality video streams. It has made it possible for anyone, anywhere to live stream an event - no matter how large or small. Dance and theatre groups, places of worship, schools, production companies, sports clubs, local community groups, and even the "person on the street" can live-stream via their social media accounts or websites. The added good news is there are now more ways to monetise video on social media. For example, social media platforms are continuing to expand on offerings that allow for pre- and post-roll ads that share a portion of the ad revenue. The second latest product from LiveU is the portable bonded-cellular LU600. This year, we've seen huge level excitement from broadcast journalists, sports companies and event producers about this solution. Whilst its benefits are many, the main ones focus on letting you get your content out faster and in even higher quality. Whilst its benefits are many, the main ones focus on letting you get your content out faster and in even higher quality. You gain the highest video quality and bitrate available, the fastest file transfer - dramatically higher than previous versions - and a high-speed, bonded Internet connection. And in true LiveU fashion, better doesn't mean more difficult to use. In fact, the LU600 has LiveU's most intuitive and fastest-to-respond interface ever. Altogether, you have a unit that's ready to capture the action when you are. The ways to use LiveU's solutions are seemingly endless. In addition to working with leading UK and international broadcasters and journalists, we've assisted seven Premier League and Championship clubs live stream everything from pre-season tours, academy and woman's games, to behind-the-scenes player interviews and training events. We've helped universities stream graduation events to family and friends around the world, provided a way for places of worship to live stream to help grow their congregation, and given local newspapers an easy way to compete on social media. The time to capture summer is now - and live streaming lets you share it with anyone, anywhere. Lorna Garrett is the co-founder of Garland. She has been providing professional and profitable digital video solutions over the past 10 years.